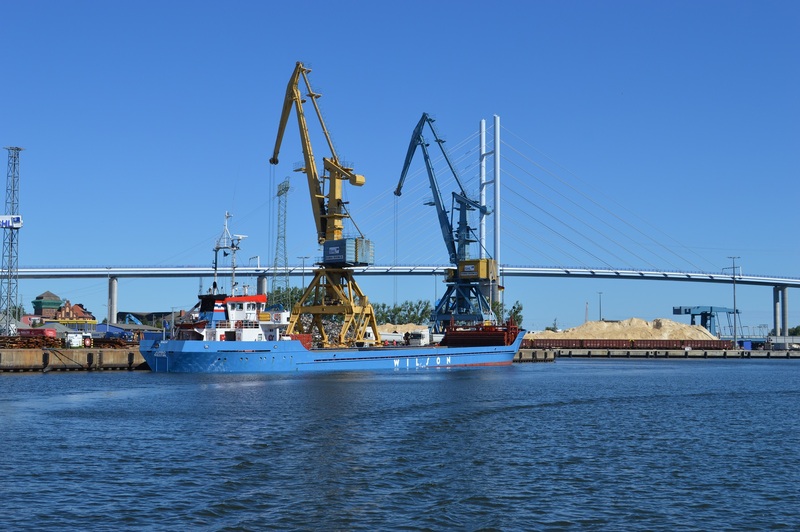 Continuing this year’s tour of the Baltic Ports Organization’s member ports, Bogdan Ołdakowski, BPO Secretary General, paid a visit to the German coast. With stops in Wismar, Mukran-Sassnitz and Stralsund, the trip focused on learning the ports’ development strategy and their take on how the future of the industry will impact their own plans. All of the three ports are closely connected to the industry. Wismar enjoys a broad variety of products and materials being funneled through the port on a daily basis, main ones being wood and forest products, metals and plant and machinery. Wood and forest products make up ca. 50% of the port’s business, followed by salt and fertilizers and scrap metal. The port acts as an important stop for north-south traffic between Central Europe and Scandinavia. It also functions as a key link in the logistic chain leading to the Baltic States and Russia. Helmut Bilz, Head of Port Operations, Marketing & Sales at the Port of Wismar, commented the meeting: “The focus was on discussions on current issues, such as the further development of cruise shipping and related issues of environmental protection, the development of the use of alternative fuels, such as LNG and its bunkering opportunities and, of course, the progressive digitization of seaports. Seehafen Wismar GmbH appreciates the cooperation on an international level in the BPO as a valuable aspect of the exchange of experiences and ideas and will continue to get involved there. The next highlight will be the participation in the BPO Conference from 5 to 7 July in Szczecin”. The Port of Mukran, located on Germany’s largest island, Rügen, benefits in many aspects from its excellent position. The easternmost deep sea port is ideally situated for short distance freight and passenger traffic to and from Sweden; Denmark (the Danish island Bornholm), Finland, Russia and the Baltic states. Furthermore, excellent nautical and sea geographic features make Mukran Port an attractive site to the offshore wind industry. The port offers spacious areas for further industrial development projects. Ingo Wetzel, Head of Port Operation at Mukran Port, said after the meeting: “It was a good opportunity to introduce ourselves and to talk about the developments at Mukran Port. Furthermore, during an excursion, we were able to demonstrate the rail connection of two different types of track system for European and Russian standards. The optimal geographical location of Mukran Port in the Baltic Sea was also highlighted. We presented our previous as well as upcoming projects and plans for the future. The focus was on the offshore wind industry and setting-up of industries on the huge area of Mukran Port”. The tour ended in Stralsund, with a little cruise of the ports waters. The port itself has seen some recent investment’s, focused on a major modernization of the harbour’s equipment and further development of local infrastructure, including the expansion of the southern harbour and construction of the new Franken harbour. The port is known for its close connection to the local shipyards, currently working on an order for cruise ships commissioned by Genting Hong Kong. It also enjoys a very good hinterland connection to the A20 autobahn. Sören Jurrat, Managing Director at the Port of Stralsund, commented on the meeting: “We had a very open-minded and intensive exchange about current issues concerning the European port policy, about upcoming activities of BPO, about the role Port of Stralsund could play in the Comprehensive Ports Group of BPO and about plans we have for the next years to develop the ports infrastructure. The main target is to strengthen the position of Stralsund Port as a logistic hub for the German shipbuilding and maritime industry and as a leading export hub for the gypsum processing industry around Northern Europe”. Staying in close relations with its members is one of the most important aspects of BPO’s activities. The ability to facilitate the exchange of experiences and knowledge between its members can only be maintained if these close relations remain upheld. We are honored by the openness with which we are always greeted by our members.